In Hermione’s trial, she has lost everything, so fears nothing. Sir, spare your threats: The bug which you would fright me with I seek. That I should fear to die? Therefore proceed. Hermione’s open, loving nature adds to the power of her words throughout the play. Leontes finds his power in a very different way, by attempting to control, distort and intimidate, which gives us a couple of good public battles to play with, the second of which is at her trial. I love playing Hermione at her weakest point, as she finds strengths in her immoveable grace and faith. Leontes’ contrasting quality and voice is always exciting to be up against, as she bats off the King’s rage and the twisted fits of obsession that he machine-guns at her. When we arrive in court, Hermione has been through the worst and has had literally everything taken away from her, including her newborn baby. Considering these mental strains and her sheer physical place of weakness, I have to work harder at finding the balance of passion and dignity in the testimony which Shakespeare gives her. She has been stripped down publicly, but I don’t want her to be robbed of her guts, wit and honour too. Thanks to Nicki and the West Yorkshire Theatre Network for letting us publish the full text of the interview here. Currently touring Yorkshire, Common Ground Theatre’s adaptation of A Winter’s Tale promises ‘this magical, mysterious play as you’ve never seen it before’. 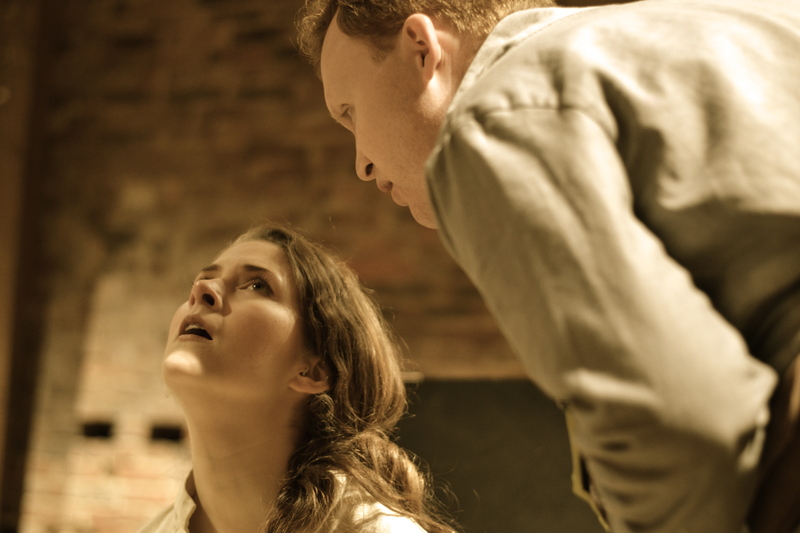 I caught up with co-director Tom Cornford ahead of their Leeds performance date. ND: Firstly, can you just tell me a little about your background. How did you get into directing? TC: I left university and trained as an actor at LAMDA. I then acted for a while and found myself thinking more and more like a director, so I decided to take a break from acting and got a job at The Gate Theatre as one of the trainee directors under the wonderful, inspirational Erica Whyman. ND: And Common Ground? How did you all come together, and for what purpose? TC: I got a job at York after I’d taken a few years of extended paternity leave during which I’d done a PhD because I decided I wanted to teach and research as well as direct. Hannah was teaching at York when I arrived and doing her PhD and we did some workshops and decided we could work together, so we started the ensemble as a way of facilitating that. Audrie has joined us more recently but Hannah’s known her for years and written for her and she’s doing her PhD on mask performance with me. ND: Why did you choose The Winter’s Tale? What was it about this particular play that appealed? TC: We knew we had to do something that had broad appeal and which could sell itself as a play, hence Shakespeare. But the company is really about making new work and trying to create theatre that communicates very directly with an audience, so we knew we wanted to adapt whichever play we chose and Winter’s Tale stood out as a good choice for that – it’s not that well-known but has a lot of features of traditional myths and stories, it has an ensemble cast, and it’s about things we’re interested in exploring: place, politics and identity. ND: I know that Hannah has adapted the play quite heavily to include modern language and even music. Why did you take this decision rather than doing a ‘straight’ adaptation? TC: Because the story is like a folk-tale or a myth that has been passed on orally, so we chose the character of Autolycus as a teller for the story (he’s a ballad-seller and con-man who turns up in Act 4 of Shakespeare’s play), and since he sells ballads, we decided that it should have music running through it. We talked about it in the early stages like turning the play into a concept album made by a punk-folk band, and I was influenced by the radio ballads that Ewan MacColl and Peggy Seeger wrote: stories and music and drama and political statements woven together. And of course we wanted the play to be accessible and to speak to now, to place the Shakespeare in a contemporary context which would bring out its extraordinary quality but also allow us to be in a dialogue with his play and not have simply to worship it. Hannah’s done an amazing job of writing alongside the Shakespeare with a mixture of humility towards it and confidence in her own voice. She looked at me like I was mad when I said I wanted her to write interventions into the play, but I’m delighted I did. It makes the whole thing work in a way it couldn’t if we were tied to the Shakespeare only. ND: You mention Hannah’s ‘humility’ towards the original text. On that topic, the adaptation of Shakespeare is certainly controversial for some people…. What do you think in general about the merits/demerits of adapting Shakespeare’s texts for a more modern audience? TC: I think it’s completely positive. Of course not all adaptations will be good, but the plays are still there – they’re not going anywhere. Shakespeare spent his life adapting other people’s plays and stories, and worked in a theatre which was completely contemporary. They didn’t spend their time doing revival upon revival of ‘classics’. They did plays which spoke to their time and their society in their language, with their resources. And there has been a long and fascinating tradition of adapting Shakespeare for centuries now. Recently, we’ve become, I think, more traditional and conventional in our attitude to Shakespeare, which has coincided with his ever-increasing cultural capital, but I think that’s something we need to question. If we’re not engaging in a dialogue with his work and asking what it says to us and what inspires us and excites us but also troubles us and bores us about it, then we’re not thinking actively about who we are and how we relate – culturally – to our past. We can’t just unthinkingly accept a national playwright whose language is – let’s face it – inaccessible to many of those least privileged in our society, and whose plays are overwhelmingly male and white. I’m not attacking him as a writer for that – he was a product of his time. But our productions of his plays are a product of our time and we have to take active responsibility for that fact. ND: You’re performing at some rather eclectic venues – including a barn and several pubs. Was this a conscious decision or…? TC: Absolutely. If live theatre is going to be genuinely accessible to people, it needs to go to where they are. So we’ve made the show to be completely flexible. We’re doing it in the back room of a tiny pub and in theatres. We just turn up and squeeze it down or expand it according to what space there is. We have some stuff that goes in the back of my car which we use when there’s space, and the actors all turn up with their own costumes and props and instruments. There’s no lighting or anything. As much of the money as possible goes to paying people. That’s what theatre’s about. So we go to where the people are. ND: Speaking of ‘the people’, your press pack mentions ‘imaginative audience participation’ playing a part in the performance. Should the audience be scared?? How do you see the role of the audience in the performance? TC: Haha! Some of them are a bit. But no – there’s no need. We do definitely want people to join in and feel that they’re a part of the event, but we’re not going to get laughs from humiliating anybody. What we mean is that we want to make shows where the audience’s imaginative participation is central to the performance, where the theatrical devices that we use are not there to take the place of the imagination but to guide and inspire it. ND: A little about your process… Your rehearsal process is described as ‘collaborative’ and devising/improvisation features heavily. How does this work in practise in the rehearsal room? And how do you see the role of the director in a collaborative rehearsal process such as this? TC: We took a number of approaches. To cut the text, we did a lot of improvisations of contemporary equivalents of the scenes to find their shape and score their action. We also did a lot of movement-based exercises to find a way of expressing physically the content and atmosphere of the story at each stage. We call this landscaping. We then took the Shakespeare and fitted the parts that we wanted to use into these scores and landscapes and worked out where we wanted to write new material. Some of this was improvised in rehearsal, some of it Hannah just wrote and brought in and then we fiddled with it. As a director in this process, the key is to keep asking questions of what you’re doing, and not to impose your solutions on everyone, but also to have an eye on the bigger picture so that you are editing and shaping the material that is generated into a score which carries the story you want to tell. One example is the soliloquies, I wanted to find a theatrical language for them which was more expressive than someone just speaking and working through their thoughts – that just didn’t fit in the context of the show. So I would ask ‘what can we do with this speech?’ and we would try out different ways of making it theatrical. I didn’t know what these would be and didn’t dream that one of them would become a phone call to a call centre – that solution just emerged naturally from the fact that we were trying to incorporate elements of contemporary life into the play in a way that folk songs and story-tellers do. ND: Finally – can you sum up the production in 10 words or fewer for any potential audience members? TC: Lively, musical, funny, poetic, provocative, wonderful theatre for a tenner. © 2019 Common Ground Theatre.